Malas, just like any other sacred object, require the utmost love and care. They hang around during your yoga practice, stick with you during meditation and amplify the energy around you on any day-to-day task. Your mala soaks up everything, from intentions to the occasional (maybe not so clean) yank from your kids or swat from your kitten – so let’s run through the steps of taking care of her, sound good? The “how-to” action steps found in this blog are all important in ensuring that your mala vibes at the highest of frequencies. These steps are also the simplest of tasks, so breathe easy. We have you covered. Sometimes even the simple notion of not leaving our mala at the bottom of a sweaty gym bag during a class can slip our minds. We’ve been there and we’re willing to bet you’ve been in the same boat at least once…if not, kudos to you babe! Carry a little jewelry bag with you. Nothing fancy, just the basics will do. If you’ve purchased from us before, you know that we gift you with one of these little bags. Keep it and re-use it to ensure your mala always has a place to rest. Pair up brushing your hair with combing your tassel. It makes for a fun self-care ritual! Please note that this step needs to be done GENTLY to avoid pulling strands out. The idea here is to untangle, straighten and add volume to the tassel. You may not need to do this on the daily, every so often will do just fine. 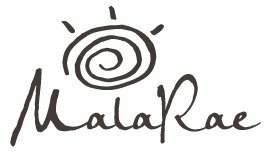 Swimming, showering and hot-tubbing with your mala (and MalaRae bracelets!) may feel extremely tempting but water can dull the beads, which is something we want to avoid in hopes that it stays of the highest quality throughout its entire lifespan. If you are very attached to your crystals and still want to keep them near; put the mala outside the shower, on the beach (if you’re swimming in the ocean), or let it re-charge on your meditation alter/in a sacred place while it is not in use. Use your time away from it as a chance to allow some space for your mala to breathe & re-calibrate. So as best as you can, keep your beads as dry as possible (apart from washing the tassel of course!). Nature: hike with your beads, place them near a stream, allow Mama Natures vibration to pulse the crystals back to life. Moonlight: (gentler energy): place the mala beads where Moonlight can easily access it. Either on a window sill or outside in direct light. Sunlight: (provides stronger energy): place mala beads outside or on a window sill for maximum 15 minutes. Note: Please be aware that some colored stones may fade if left out in the sun for too long. Be sure to keep an eye on them and the length you leave them out. If you are drawn towards using sunlight to cleanse your mala, we recommend placing them outside during sunrise or sunset when the sun’s rays aren’t as strong. Smudging, Sage cleaning and/or Incense: light some Sage. Allow the smoke to wisp around the crystals. Rejoice, it’s a celebration of renewal and rebirth. Meditation/Visualization: sit in meditation for whatever time feels right and visualize the cleansing of your crystals. Example: Picture your mala in your mind’s eye, feel it hanging around your neck and resting against your skin, then visualize a bright white light coming down from the tip of your head moving to the tip of your toes, enveloping you and your mala in a shield of gorgeous purification. Sound Vibration (singing bowl, chanting, mantras etc. ): Press play on your fav mantras, chant your heart out, or ring your singing bowl for all to hear. Let the power of sound vibration do all the work. Your job is to bask in all the love that’s being created, and send some of that cultivated love to your mala. What are your mala care rituals? Share them with us in the comment section below.